Smooth Cord-grass, also known as oyster grass or saltwater cordgrass, is most recognizable as the tall grass found in wetlands. It grows in salt marshes and varies in height greatly. Its mature height depends on its proximity to the water. The closer it is to water, the taller it will grow. Once it reaches maturity, typically a height of about 12 inches, smooth cordgrass resembles wheat in appearance because of the seeds that can be found near the top of each blade. When it is young, you will notice a red tinge to the leaves--this is how you will know that it is healthy. 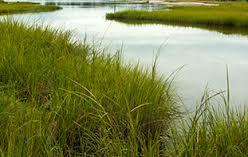 Smooth Cordgrass is native to the east coast of North and South America and is planted to control erosion in these areas. In landscaping, it is most often used around ponds to neutralize the soil, which helps with growing other plants nearby. While the appearance of smooth cordgrass would lead you to believe it produces a lot of seeds, most of the seeds you see are empty or unable to produce more plants. 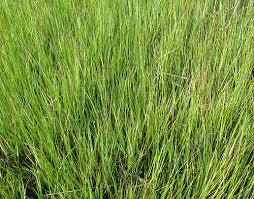 Therefore, smooth cordgrass is sold and planted as a bare root. Smooth cordgrass will need to be planted in an area with low water circulation, as too much water circulation will cause them to dislodge. It is recommended that you do not plant this grass before April first unless the last frost comes in your area before April first. One great thing about smooth cordgrass is it is a perennial and will return year after year with no or low maintenance. Smooth cordgrass is perennial and ships in bare-root form. Smooth Cord-grass is an estuary dwelling species that develops flowers and seeds on only one side of the stalk. This plant grows to 3-5 feet in height, with long tapered blades that fold downward. Intolerant of shade, the smooth cordgrass is a vital plant species in estuaries on the eastern coast. It's roots provide essential food for snow geese, and can grow in a wide range of salinity, from fresh to salt waters.